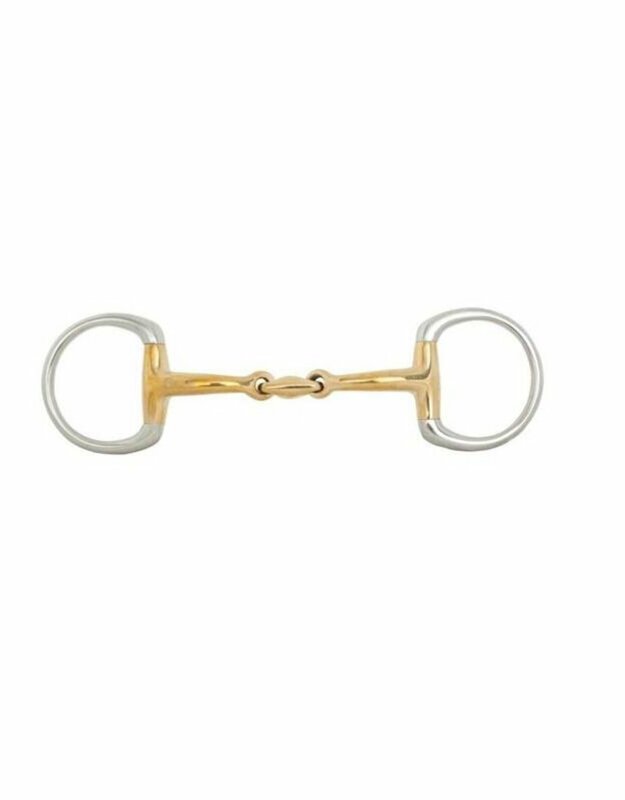 This high-quality double jointed eggbutt snaffle is made of solid Cuprigan with stainless steel rings. Cuprigan is an alloy consisting of 89% copper, 7% aluminium, 3% iron and 1% zinc. The oxidation process of the material gives a pleasant smell and taste. The anatomical design of the bit follows the shape of the horse’s mouth, which allows for a gentle and even pressure distribution. The design, combined with the unique properties of Cuprigan, encourages the chewing process and saliva production, which allows for a pleasant connection with the sensitive horse’s mouth. The bit applies mild pressure on the mouth. Mouthpiece thickness 12 mm, ring size 55 mm. The eggbutt snaffle has fixed cheek pieces. Aids have a more direct effect and the bit allows less freedom of movement compared to the loose ring snaffle, making it better suited for horses that tend to play with the bit too much.